The last couple nights produced our best trips of the Fall to date. 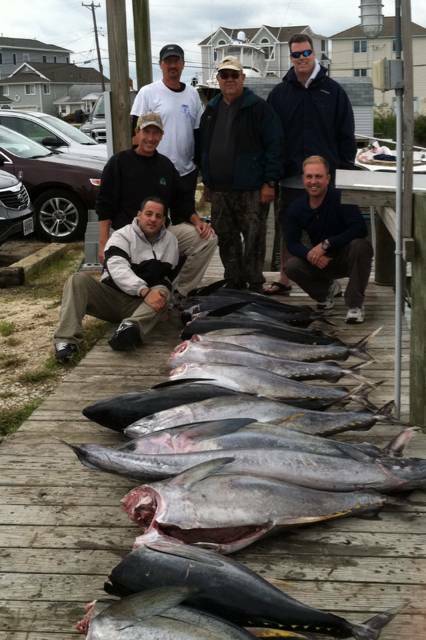 We hooked 16 and 20 fish on our last two trips and the guys boated 8 and 13, obviously fighting a good many more. These are not the 45-55 pound fish we've been catching most of the season, but a larger school, some of which are in the low 70 pound range. They are tough fighting fish for sure. All the action has come on the drift on sardines. Most of the bites have been up top with the tuna feeding in the upper 50 feet of the water column. Hopefully this is a sign of the beginning of a great October Yellowfin run. We also saw our first Longfin tuna of the season, caught a nice Wahoo on the troll, and jumped off a decent sized Mako on a 60 pound fluro carbon leader.